Showing items in category Trinidad and Tobago, sorted by newest listed first. 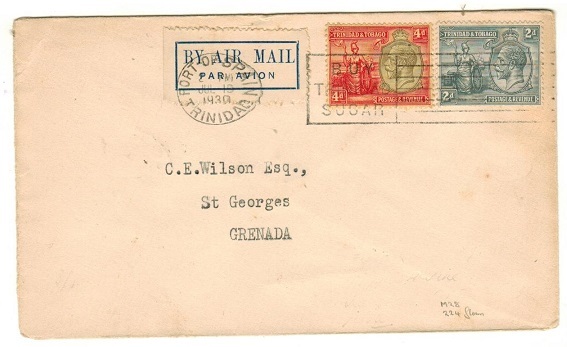 TRINIDAD AND TOBAGO - 1919 'War Tax' (SG 176)registered inter island cover to Grenada. 1919 (MR.25.) registered cover addressed to Grenada bearing a fine block of four of the 1d 'War Tax' adhesive (SG 176) tied by REGISTRATION/GPO TRINIDAD cds. A scarce genuine inter-island use. TRINIDAD AND TOBAGO - 1918 'War Tax' registered cover to Switzerland. 1918 (AP.27.) registered cover to Switzerland bearing 1d and 1d (strip of thre) 'War Tax' adhesive (SG 185) together with 1d 'War Tax' (SG 188) tied by GENERAL POST OFFICE/ TRINIDAD cds. TRINIDAD AND TOBAGO - 1918 1d 'War Tax' block of four (SG 182) on registered cover to St.Thomas. 1918 (JA.10.) 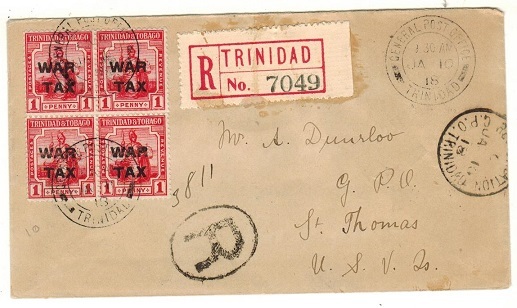 registered cover addressed to St.Thomas in the US Virgin Islands bearing a fine block of four of the 1d 'War Tax' adhesive (SG 182) tied by GENERAL POST OFFICE/ TRINIDAD cds. 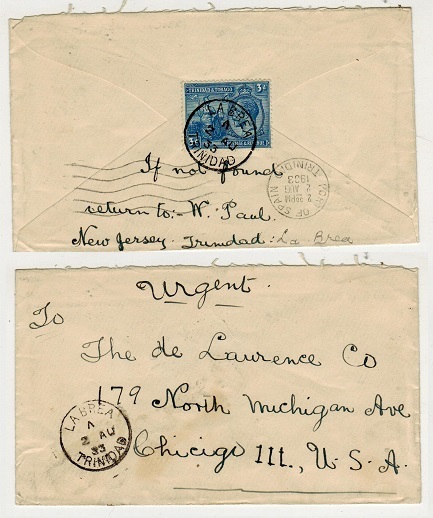 TRINIDAD AND TOBAGO - 1918 1d 'War Tax' pair (SG 188) on cover to USA used at SAN FERNANDO. 1918 (MR.30.) 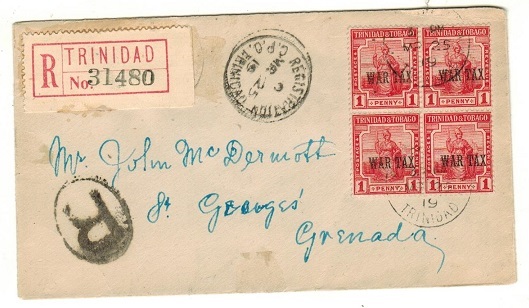 commercial cover addressed to USA bearing 1d 'War Tax' adhesive pair (SG 188) tied by SAN FERNANDO/TRINIDAD cds. TRINIDAD AND TOBAGO - 1972 1/6d POSTAL ORDER issued at PORT OF SPAIN/TRINIDAD. 1972 (JAN.18.) 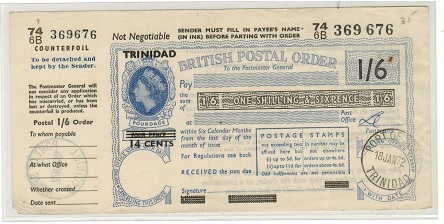 issued 1/6d (14c on 4d poundage) GB postal order overprinted TRINIDAD and cancelled PORT OF SPAIN/TRINIDAD at issue office. TRINIDAD AND TOBAGO - 1930 first flight 'NYRBA' cover to Grenada. 1930 (JUL.19.) first flight cover by NYRBA to Grenada bearing 2d and 4d adhesives tied by PORT OF SPAIN/BUY TRINIDAD SUGAR slogan strike. Only 224 covers were flown. 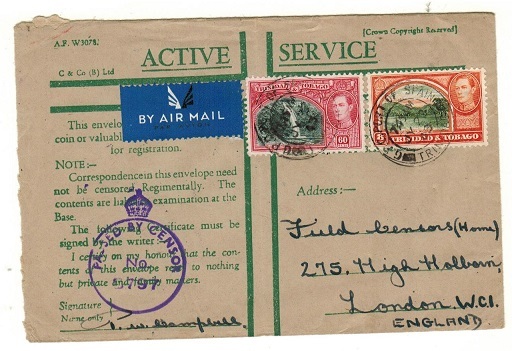 TRINIDAD AND TOBAGO - 1943 censored use of ACTIVE SERVICE green cross envelope to UK. 1943 (JY.22.) use of ACTIVE SERVICE (A.F. 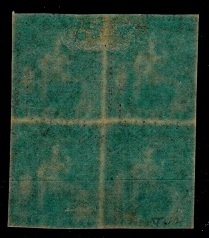 W3078) green cross envelope addressed to UK bearing 8c and 60c adhesives tied PORT OF SPAIN/TRINIDAD and struck by violet crowned circle PASSED BY CENSOR/No.8797 strike at lower left. 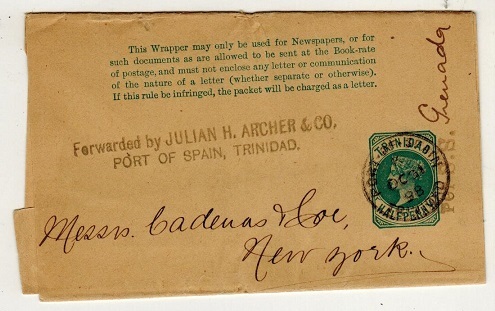 TRINIDAD AND TOBAGO - 1915 1/2d green postal stationery wrapper uprated to USA. H&G 1. 1915 1/2d green on buff postal stationery wrapper addressed to USA bearing additional 1d brown adhesive tied PORT OF SPAIN/TRINIDAD and dated AP.21.32. H&G 1. TRNIDAD AND TOBAGO - 1915 1d carmine postal stationery wrapper used to Belgium. H&G 2. 1915 1d carmine on buff postal stationery wrapper addressed to Belgium cancelled by PORT OF SPAIN/TRINIDAD cds dated NO.7.23. H&G 2. 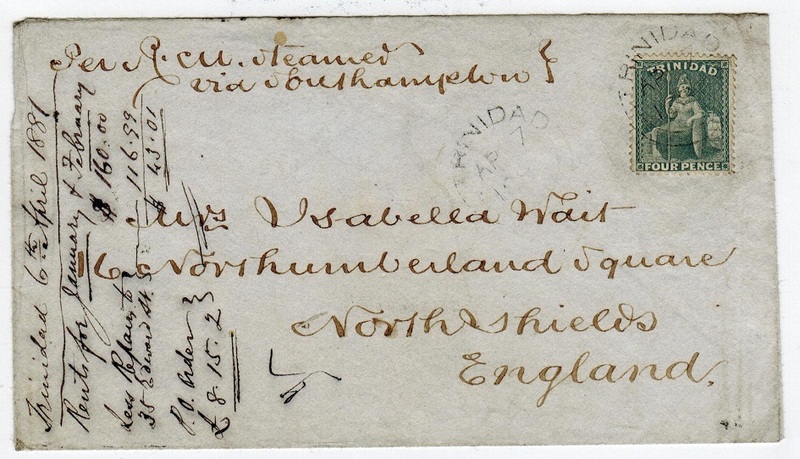 TRINIDAD AND TOBAGO - 1859 inward 1/- rate wrapper from UK with TRINIDAD arrival b/s. 1859 inward cover from UK bearing 1/- green (cut straight at bottom) cancelled by diamond barred '8' strike (2 vertical folds) & lightly cancelled on reverse by TRINIDAD (double arc) arrival cds dated APR 59. 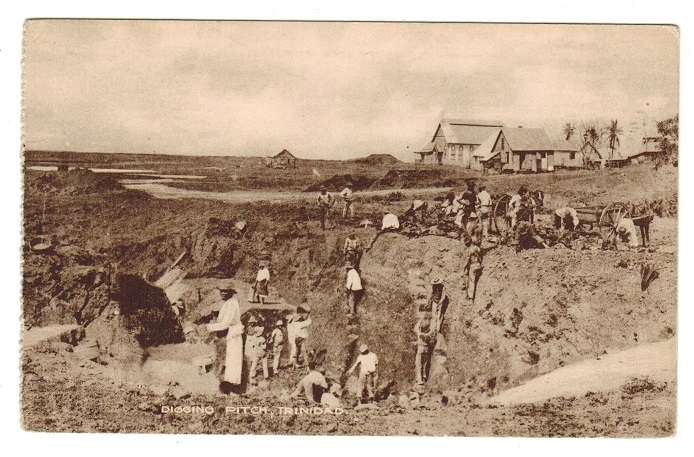 TRINIDAD AND TOBAGO - 1908 1d rate postcard use to UK used at CLAXTON BAY. 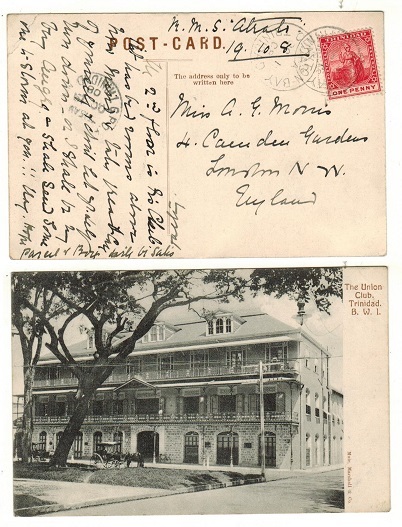 1908 (OC.1) use of picture p'card addressed to UK depicting 'The Union Club, Trinidad' & marked inmanuscript 'R.M.S.Atralo' bearing 1d adhesive tied by CLAXTON BAY/TRINIDAD cds (Proud type D4 code A). TRINIDAD AND TOBAGO - 1911 1d rate postcard use to Canada used at CARENAGE. 1911 (JA.3.) use of picture postcard addressed to Canada depicting 'Maraval Waterworks' and bearing 1d adhesive tied by scarce s/r CARENAGE/TRINIDAD cds. (Proud type D3). 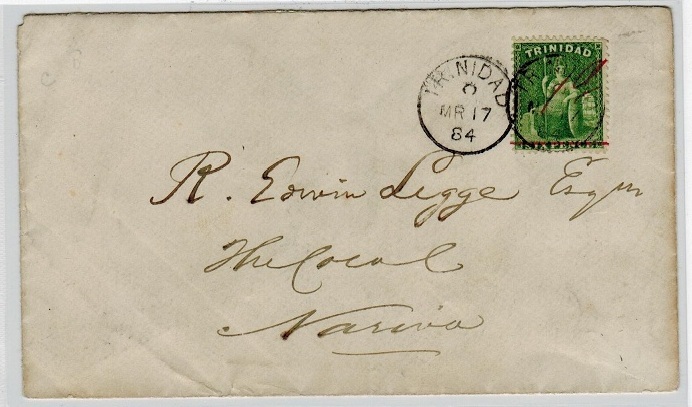 TRINIDAD AND TOBAGO - 1884 1/2d green postal stationery wrapper to USA with 'Forwarding' h/s. 1884 1/2d green on buff postal stationery wrapper addressed to USA cancelled by PORT OF SPAIN/TRINIDAD cds dated OC.31.98 and handstamped in black by two lined FORWARDED BY JULIAN H.ARCHER & Co./PORT OF SPAIN, TRINIDAD. A scarce forwarding marking. H&G 1. 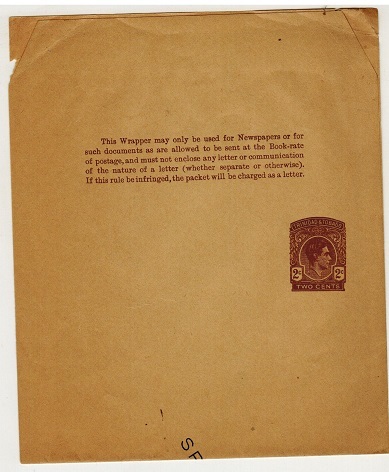 TRINIDAD AND TOBAGO - 1938 (KE VIII) 'photographic' ESSAY of the proposed un-issued adhesive. 1938 (King Edward VIII) 'photographic' ESSAY of the proposed un-issued adhesive showing circle with TRINIDAD & TOBAGO in arc below. 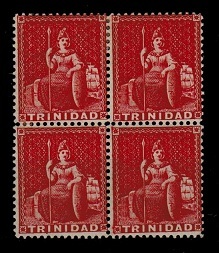 TRINIDAD AND TOBAGO - 1918 1d scarlet 'War Tax' mint block of 12 with WIDER SPACE A (x2). SG 189. 1918 1d scarlet 'War Tax' issue of the new printing on light bluish paper in a fine mint block of 12 showing the WIDER SPACED A and X IN TAX on two stamps. This occurred 19 times on the sheet. SG 189. 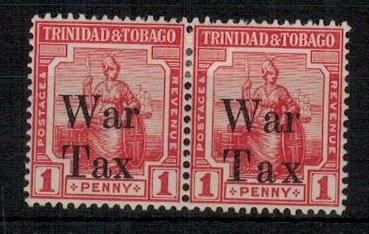 TRINIDAD AND TOBAGO - 1918 1d scarlet 'War Tax' mint pair with WIDER SPACE A in tax. SG 189. 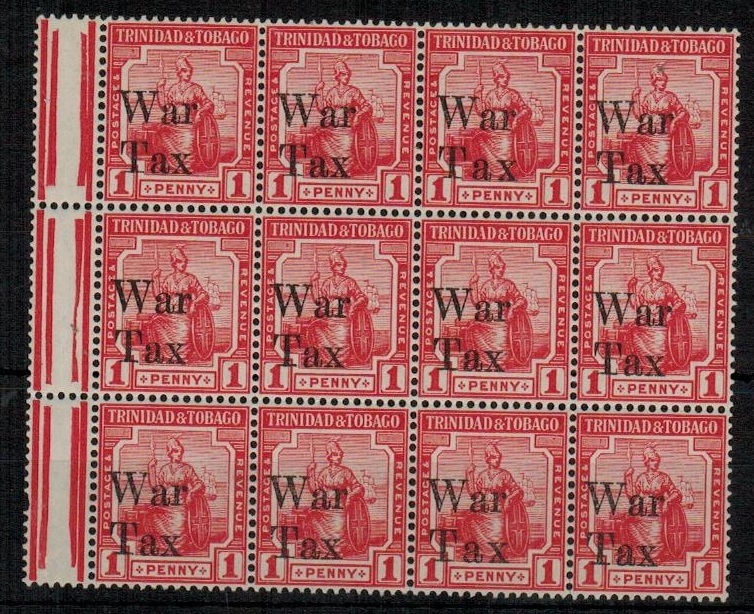 1918 1d scarlet 'War Tax' issue of the new printing on light bluish paper in a fine mint pair with one stamp showing the WIDER SPACED A and X IN TAX which occurred 19 times on the sheet. SG 189. TRINIDAD AND TOBAGO - 1916 1d scarlet 'Red Cross' mint with MISSING STOP AFTER 16. SG 175a. 1916 1d scarlet 'Red Cross - 19.10.16' adhesive in a fine mint marginal example showing the variety MISSING STOP AFTER 16. SG 175a. 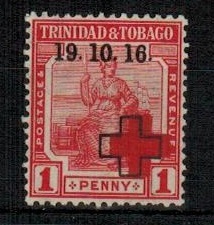 TRINIDAD AND TOBAGO - 1916 1d scarlet 'Red Cross' mint with RED CROSS OUT OF ALIGNMENT. SG 175. 1916 1d scarlet 'Red Cross - 19.10.16' adhesive in a fine mint marginal example showing the variety RED CROSS OUT OF ALIGNMENT WITH FRAME. SG 175. TRINIDAD AND TOBAGO - 1935 'Silver Jubilee' registered FDC to UK. 1935 'Silver Jubilee' registered first day cover addressed to UK bearing the series (SG 239-42) each tied by REGISTRATION GPO/TRINIDAD cds's. TRINIDAD AND TOBAGO - 1935 1d 'rate 'Silver Jubilee' on cover to UK used at TUNAPUNA. 1935 (OCT.30.) cover addressed to UK bearing 3c 'Silver Jubilee' adhesive on reverse flap cancelled by TUNAPUNA/TRINIDAD cds. TRINIDAD AND TOBAGO - 1917 1d scarlet 'War Tax' U/M with MISPLACED OVERPRINT. SG 178b. 1917 1d scarlet 'War Tax' issue in fine unmounted mint condition showing a gross misplacement of overprint reading 'AR W/AX T'. SG 178b. TRINIDAD AND TOBAGO - 1887 4d rate cover to USA. 1887 (MY.2.) cover addressed to USA bearing 4d grey adhesive (SG 110) tied TRINIDAD with inverted 'A' code slug. TRINIDAD AND TOBAGO - 1930 'NYBRALINE' first flight cover from Scarborough to Trinidad. 1930 (MY.16.) 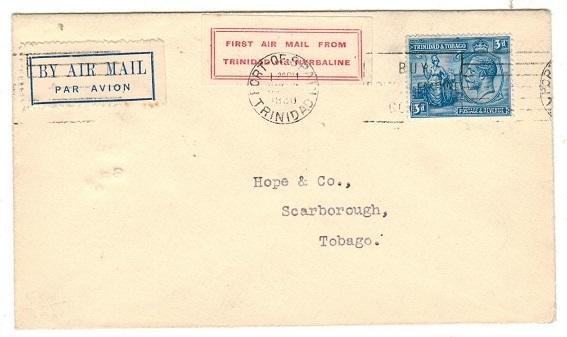 first flight cover addressed to Port Of Spain bearing 3d blue adhesive tied by SCARBOROUGH/TOBAGO cds. Flown by the NNYRBA line with only 443 covers taken. TRINIDAD AND TOBAGO - 1930 'NYRALINE' first flight cover to Tobago. 1930 (MAY.9.) 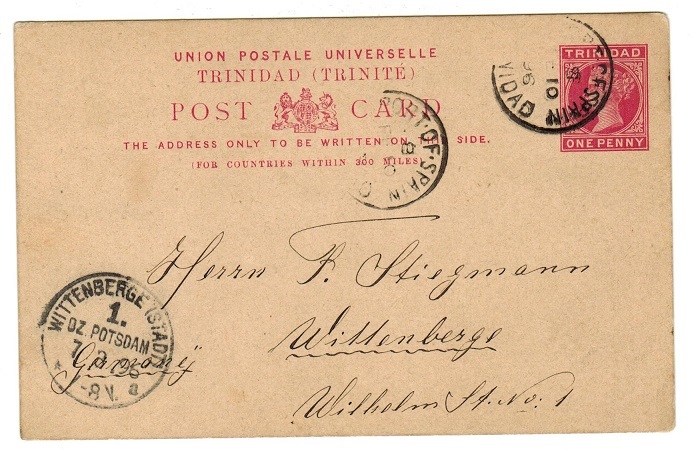 first flight cover addressed to Scarborough in Tobago bearing 3d blue adhesive tied by PORT OF SPAIN/TRINIDAD roller strike. Red 'TRINIDAD VIA NYBRALINE label applied and with SCARBOUGH arrival b/s. Only 487 covers flown. TRINIDAD AND TOBAGO - 1940 30c rate censored cover to USA. 1940 (MR.7.) 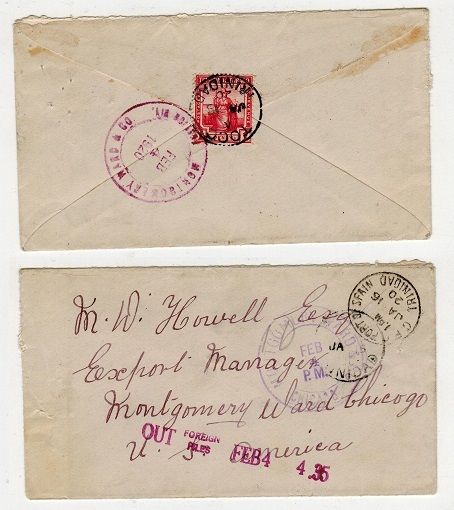 commercial cover addressed to USA bearing 6c and 12c pair tied PORT OF SPAIN and struck on the front by violet crowned PASSED BY/POSTAL CENSOR/6 handstamp (Miller type TR CH4a and with manila strip at right struck by violet OPENED BY CENSOR h/s. TRINIDAD AND TOBAGO - 1940 6c rate censored cover to USA. TRINIDAD AND TOBAGO - 1941 5c rate censored cover to Haiti. 1941 (JA.8) cover to Haiti bearing 2c+3c adhesives tied PORT OF SPAIN with brown censor strip at right tied on reverse by violet CROWN-PASSED BY/POSTAL CENSOR/4 h/s. TRINIDAD AND TOBAGO - 1958 first flight cover to UK. 1958 (OC.29.) use of illustrated 'B.O.A.C.' first flight cover addressed to UK bearing 3c, 8c and 24c adhesives tied GPO PORT OF SPAIN/TRINIDAD. 1937 2c brown on buff postal stationery wrapper struck SPECIMEN diagonally in black. H&G 5. 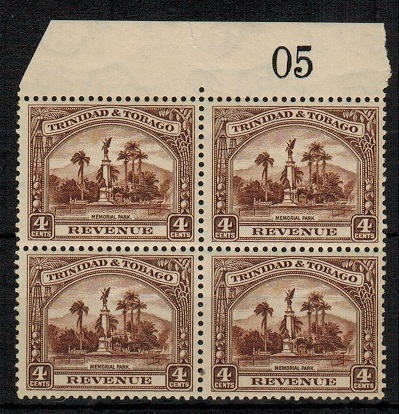 TRINIDAD AND TOBAGO - 1934 4c brown REVENUE mint block of four. 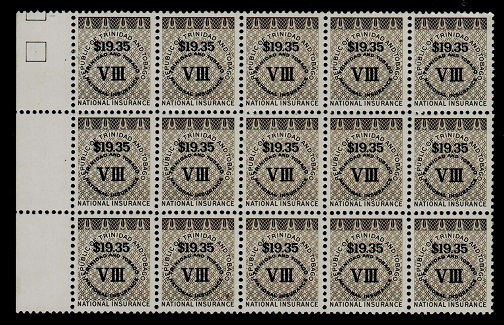 1935 4c brown REVENUE adhesive in a fine mint top marginal block of four with overall toned gum and showing sheet '05' in margin. A scarce item in such a multiple. Barefoot 21. TRINIDAD AND TOBAGO - 1851 1d (no value) FOURNIER PROOF forgery handstamed FAUX. 1851 1d (SG type 2-no value expressed) 'Fournier' PROOF forgery printed in red on cream paper and handstamped FAUX. TRINIDAD AND TOBAGO - 1930 1/2d rate cover to UK used on 'S.S.VENEZUEL'. 1930 (MRT.11.) 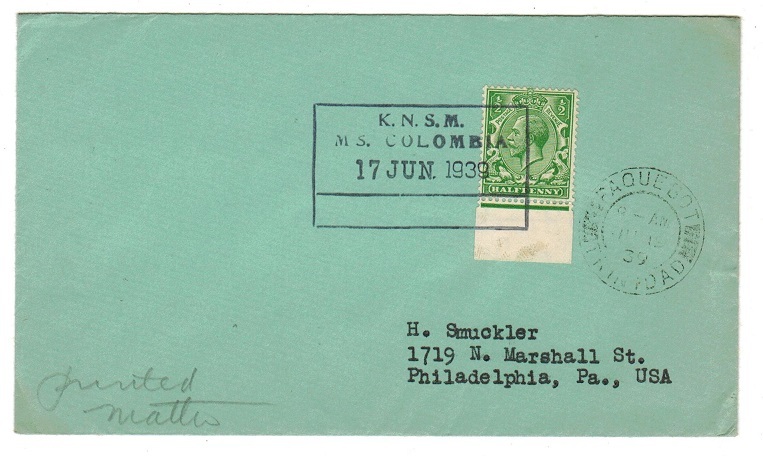 cover addressed to UK bearing 1/2d green adhesive tied by violet boxed K.N.S.M./ S.S.VENEZUEL maritime handstamp. Few light tone spots on reverse. TRINIDAD AND TOBAGO - 1939 1/2d + 1d red meter mark cover to UK. 1939 1/2d and 1d 'POSTAGE/PAID' red meter marks applied to cover to UK with PORT OF SPAIN cds at left and commercial GO TO/GEDDES GRANT/FOR THE FINEST LINES/OF/OFFICE EQUIPMENT commercial advert. A nice early meter mark cover. TRINIDAD AND TOBAGO - 1980 (circa) $19.35 brown NATIONAL INSURANCE U/M block of 15. 1980 (circa) $19.35 brown NATIONAL INSURANCE stamp in a fine unmounted mint left marginal block of 15. TRINIDAD AND TOBAGO - 1980 (circa) $7.35 grey blue NATIONAL INSURANCE U/M block of 15. 1980 (circa) $7.35 grey-blue NATIONAL INSURANCE stamp in a fine unmounted mint left marginal block of 15. TRINIDAD AND TOBAGO - 1931 1d rate local cover used at POINT FORTIN. 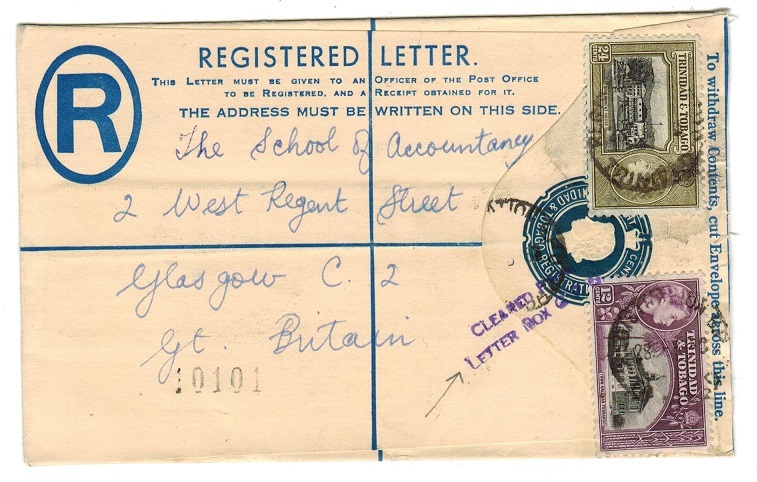 1931 (MR.16) cover addressed locally bearing 1d (SG 219) tied by POINT FORTIN/TRINIDAD cds. TRINIDAD AND TOBAGO - 1933 3d rate cover to USA used at LA BREA. 1933 (AU.2) cover to USA bearing 3d (SG 223) on reverse flap tied LA BREA/TRINIDAD with similar strike on front. TRINIDAD AND TOBAGO - 1934 1d rate cover to USA used at PALO SECCO. 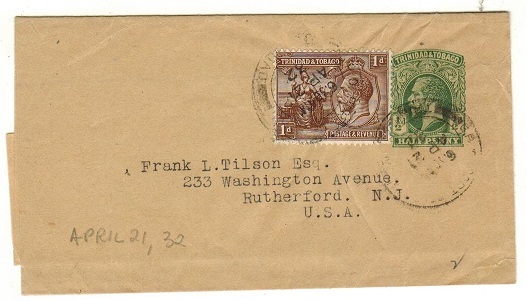 1934 (NOV.24) cover to USA bearing 1/2d pair (SG 218) tied by PALO SECCO/TRINIDAD cds. Complete with origin letter. TRINIDAD AND TOBAGO - 1884 1d carmine postal stationery wrapper used to UK. H&G 2. 1884 1d carmine on buff postal stationery wrapper addressed to UK cancelled TRINIDAD abd dated MR.2.89 with sideways 'A' code slug. H&G 2. TRINIDAD AND TOBAGO - 1916 2 1/2d rate cover to USA. 1916 (DE.19.) 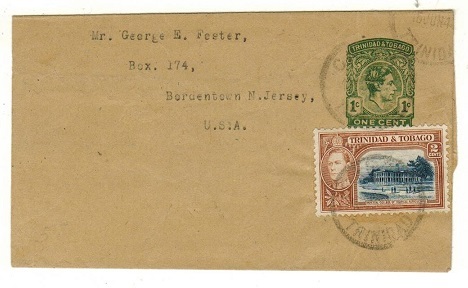 cover addressed to USA bearing 2 1/2d blue tied GPO.PORT OF SPAIN. 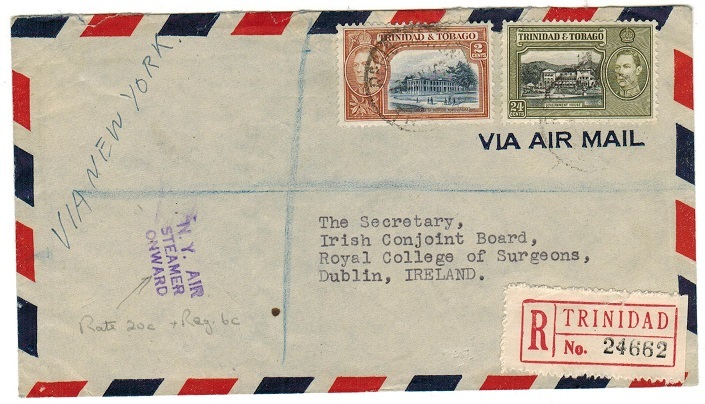 TRINIDAD AND TOBAGO - 1946 cover to Ireland with NY AIR/STEAMER/ONWARD handstamp applied. 1946 (7.JAN.) 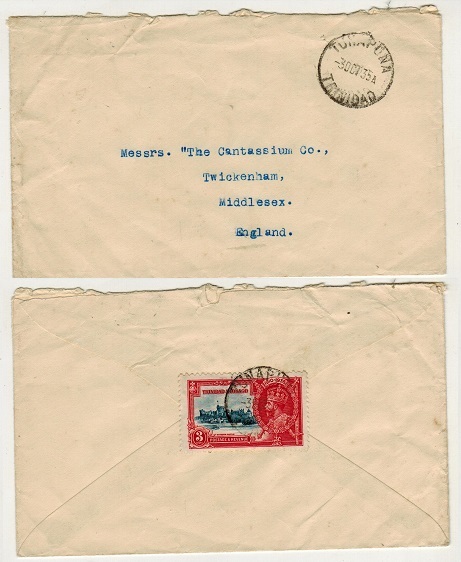 registered cover addressed to UK bearing 2c and 24c adhesives tied by REGISTRATION/TRINIDAD cds and struck by three lined NY AIR/STEAMER/ONWARD h/s in violet. Proud type AM10. 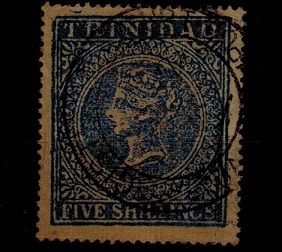 TRINIDAD AND TOBAGO - 1895 2d blue RPSE to UK uprated with 1d and 4d. H&G 7. 1895 2d blue on cream (grey text) registered postal stationery envelope (size G) addressed to UK bearing additional 1d and 4d adhesives tied REGISTRATION/TRINIDAD and dated MR.9.04. H&G 7. 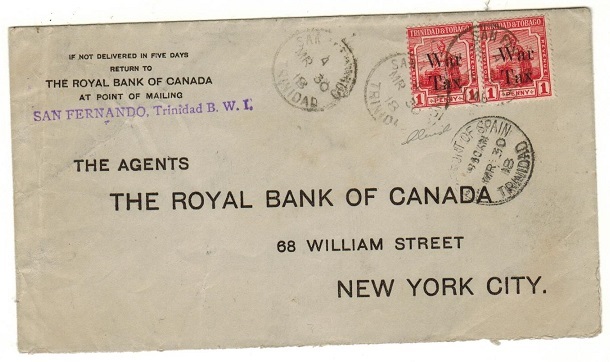 TRINIDAD AND TOBAGO - 1933 3d rate cover to Canada used at ST.JULIENS. 1933 (JA.26.) 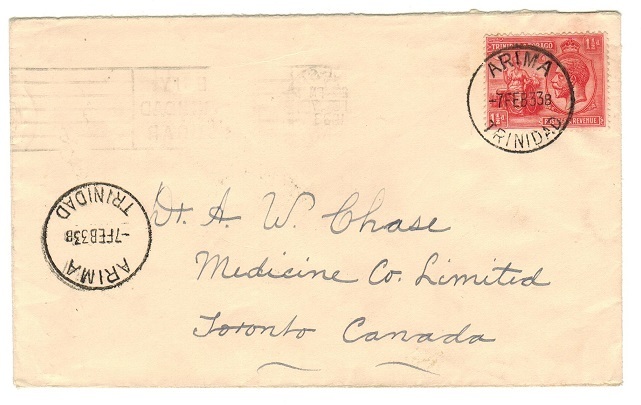 cover addressed to Canada bearing 3d adhesive tied by scarce ST.JULIENS cds. (Proud type D2). TRINIDAD AND TOBAGO - 1933 1 1/2d rate cover to Canada used at ARIMA. 1933 (FE.7.) 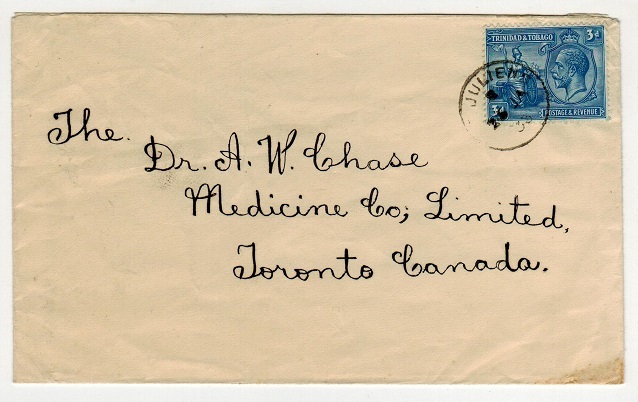 cover addressed to Canada bearing 1 1/2d adhesive tied by ARIMA/TRINIDAD cds. TRINIDAD AND TOBAGO - 1943 censor cover to USA. 1943 (MR.16.) cover addressed to USA bearing 8c orange 'Coronation' adhesive tied by GPO PORT OF SPAIN/TRINIDAD cds with manila censor strip across the top edge. Additional P.C.90/OPENED BY/EXAMINER 8646/ FORM 167 censor label applied over at left edge (Miller type TR CL3) with 'IE-' handstamp applied in violet. TRINIDAD AND TOBAGO - 1869 5/- FORGERY in red with bogus cancel. 1869 5/- (SG type 5) perforated FORGERY with bogus cancel printed in deep plum. TRINIDAD AND TOBAGO - 1869 5/- FORGERY in blue with bogus cancel. 1869 5/- (SG type 5) perforated FORGERY with bogus cancel printed in deep blue. TRINIDAD AND TOBAGO - 1941 censor cover to USA. 1941 (JUL.5.) 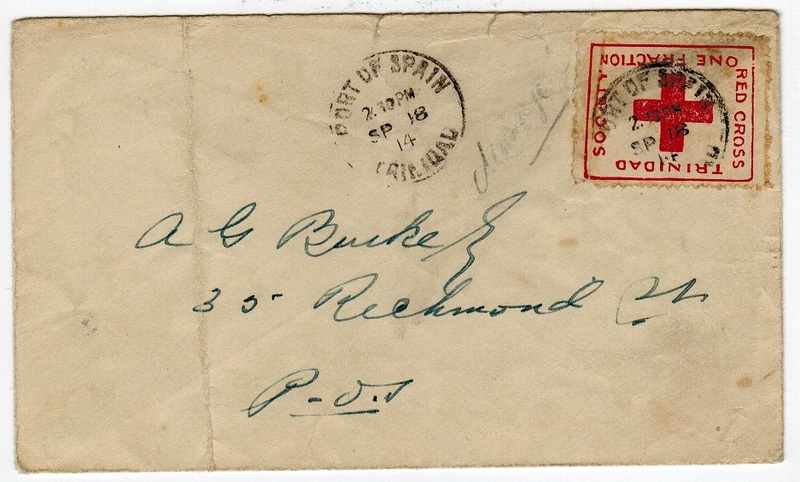 cover addressed to USA bearing 6c and 8c (x3) tied by PORT OF SPAIN cds's with violet circular crowned PASSED BY/POSTAL CENSOR/2 h/s applied. Miller TR CH4a. 1941 cover addressed to USA bearing 6c adhesive tied by PORT OF SPAIN/GROW MORE FOOD slogan strike with manila censor strip at right edge tied on the front by straight lined OPENED BY CENSOR No.7. h/s. Miller type TR CH5. TRINIDAD AND TOBAGO - 1942 censor cover to USA. 1942 cover addressed to USA (central fold and glue marks on reverse from mounting) bearing 4c pair tied PORT OF SPAIN and with manila censor strip at left tied on the front by violet straight lined OPENED BY CENSOR NO.5 h/s. Millet type TR CH5. 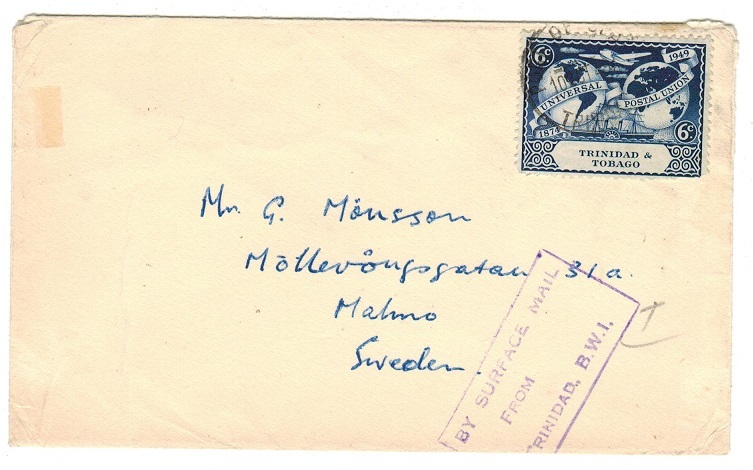 TRINIDAD AND TOBAGO - 1949 BY SURFACE MAIL FROM/TRINIDAD cachet on cover to Sweden. 1949 (OCT.10.) cover addressed to Sweden (ex part of reverse flap) bearing 6c UPU adhesive tied by part PORT OF SPAIN/TRINIDAD cds and struck by violet boxed BY SURFACE MAIL/ FROM/TRINIDAD B.W.I. h/s. TRINIDAD AND TOBAGO - 1946 inward 'PAA' test cover. 1946 (NO.1.) inward 'test' cover from USA handstamped by red boxed RETURN TO SENDER h/s and with 8c and 12c adhesives added and tied G.P.O.PORT OF SPAIN/TRINIDAD and dated NOV.4. 46 for the return flight. Cover used by Pan American Airways to test arrival times. Blue-green boxed PAN AMERICAN AIRWAYS/TRINIDAD b/s. TRINIDAD AND TOBAGO - 1938 3c rate cover to UK used at LA BREA. 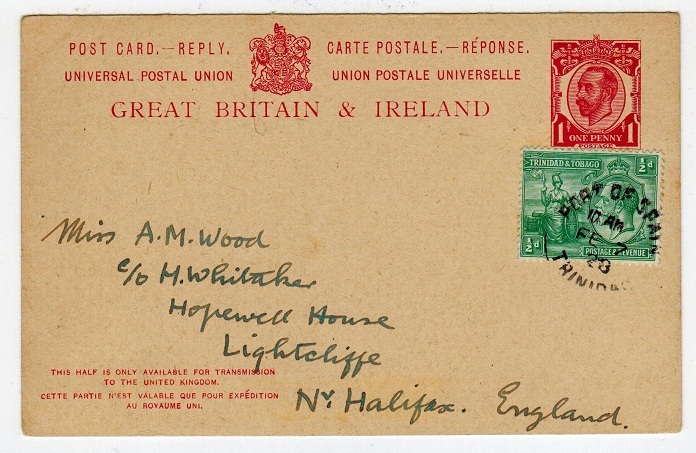 1938 (AUG.5) cover to UK bearing 1c+2c adhesives(SG246+7) tied by LA BREA/TRINIDAD cds. TRINIDAD AND TOBAGO - 1939 'GB' 1/2d on maritime M.S.COLOMBIA cover to USA. 1939 (JUN.17.) cover addressed to USA bearing 'GB' 1/2d adhesive paying the 'printed matter' rate tied by black boxed K.N.S.M./M.S.COLUMBIA handstamp with PAQUEBOT/TRINIDAD cds alongside dated JU.19.39. TRINIDAD AND TOBAGO - 1948 'Stamp Exhibition' cover struck by 'skeleton' WHITEHALL cds. 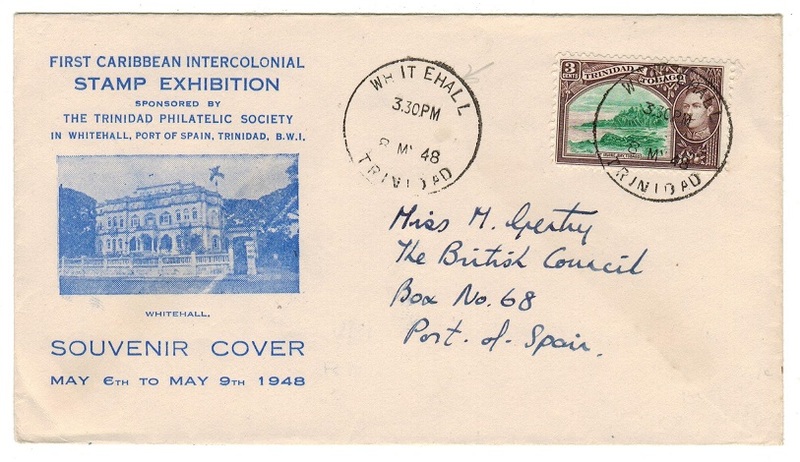 1948 (My.8) illustrated FIRST CARIBBEAN INTERCOLONIAL/STAMP EXHIBITION/TPS souvenier cover addressed locally and bearing (SG 248a) tied by the scarce 'SKELETON' type WHITETHALL/TRINIDAD. TRINIDAD AND TOBAGO - 1949 illustrated UPU first day cover used at SIPARIA. 1949 (OCT.10.) 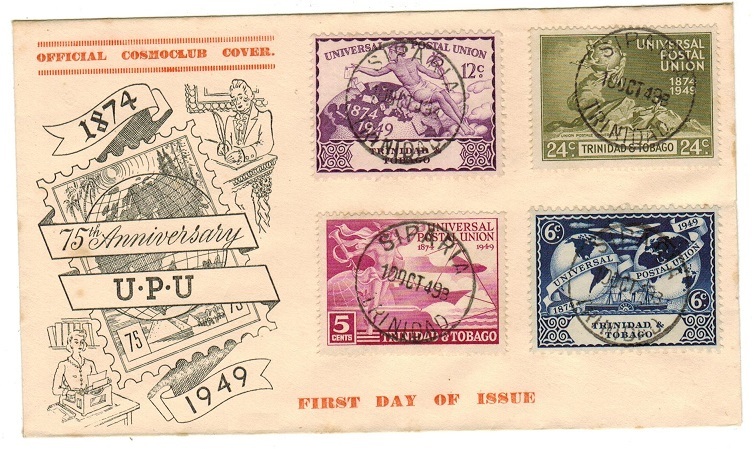 illustrated first day cover bearing the 'UPU' set of four (SG 261-64) each tied by SIPARIA/TRINIDAD cds's. Philatelic but a scarcer village use. 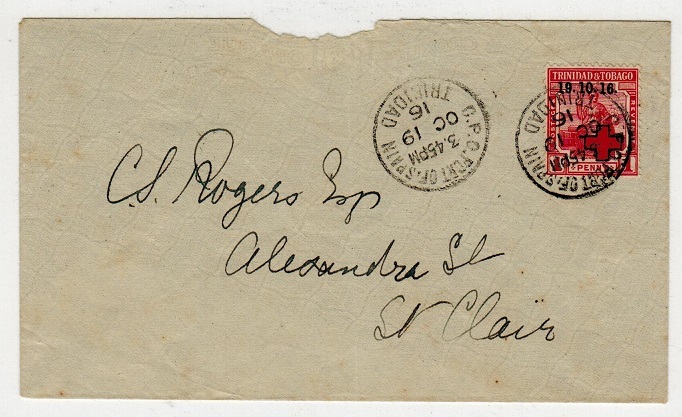 TRINIDAD AND TOBAGO - 1918 'War Tax' combination cover used locally to St.Clair. 1918 (MY.23.) locally addressed cover to St.Clair bearing 1d adhesive tied with 1d WAR/TAX adhesive by GPO PORT OF SPAIN/TRINIDAD cds. TRINIDAD AND TOBAGO - 1917 local 'War Tax' cover with rare UNCLAIMED handstamp. 1917 (JY.4.) 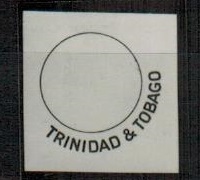 cover addressed locally to St.James bearing 1/2d and 1/2d 'War Tax' adhesives tied by PORT OF SPAIN/TRINIDAD cds's. The cover was not delivered and has been struck on the front by two examples of the UNCLAIMED h/s in black (Proud type I9). The cover was then re-directed with WOODBROOK arrival b/s but again undelivered and receiving a further UNCLAIMED h/s but in a narrower font and thus un-recorded by Proud from Woodbrook. A nice item. TRINIDAD AND TOBAGO - 1920 1d rate cover to USA used at TOCO. 1920 (JA.15.) 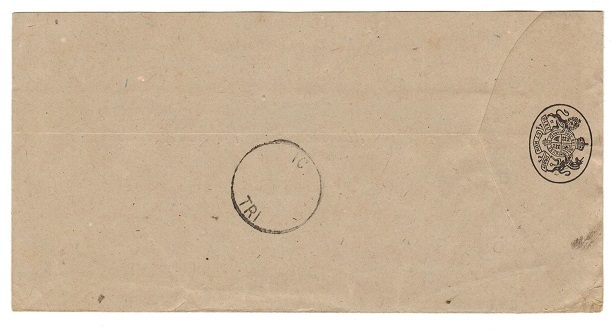 cover addressed to USA bearing 1d (SG 150) tied to reverse flap by TOCO/TRINIDAD cds. 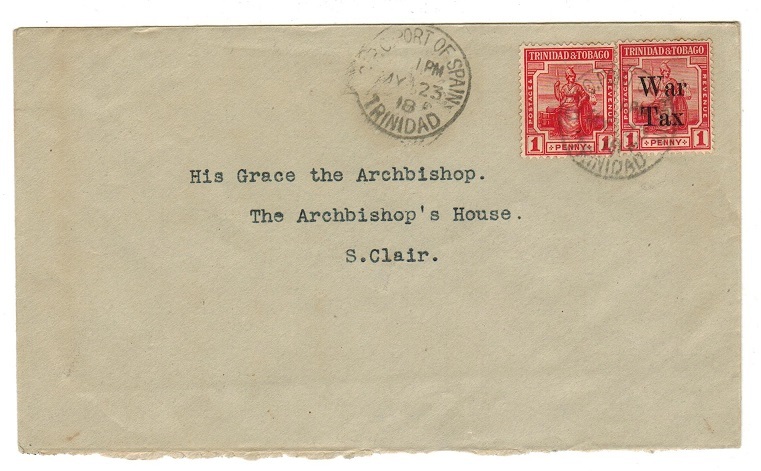 TRINIDAD AND TOBAGO - 1916 1d 'Red Cross' cover sent locally to St.Clair. 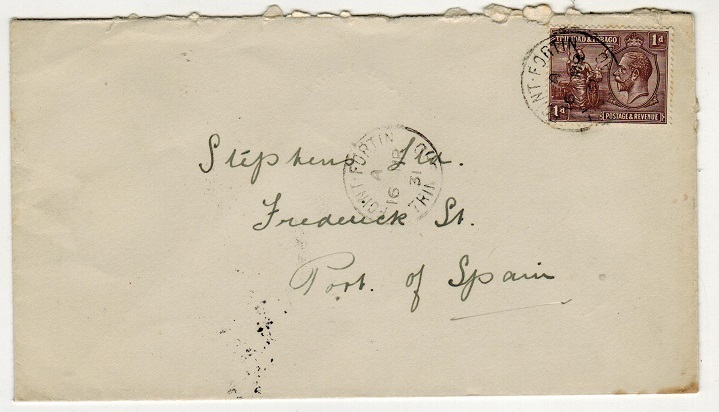 1916 (OC.19) cover addressed locally to St.Clair (a little roughly opened at top) bearing 1d 'Red Cross' adhesive (SG 175) tied by GPO PORT OF SPAIN/TRINIDAD cds. 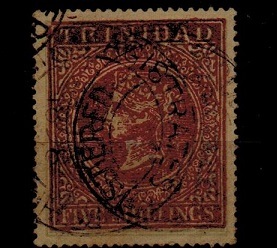 TRINIDAD AND TOBAGO - 1869 5/- with code'2' cancel used at SAN FERNANDO. SG 87. 1869 5/- rose lake adhesive (perf 12 1/2 gauge) cancelled by full single ringed 2/MY.26.1875 cds used at SAN FERNANDO. (Proud type D4). A scarce numeral strike on this high value. SG 87. TRINIDAD AND TOBAGO - 1935 72c myrtle green and carmine unmounted mint. SG 238. 1935 72c myrtle green and carmine in a very fine unmounted mint corner marginal example. SG 238. 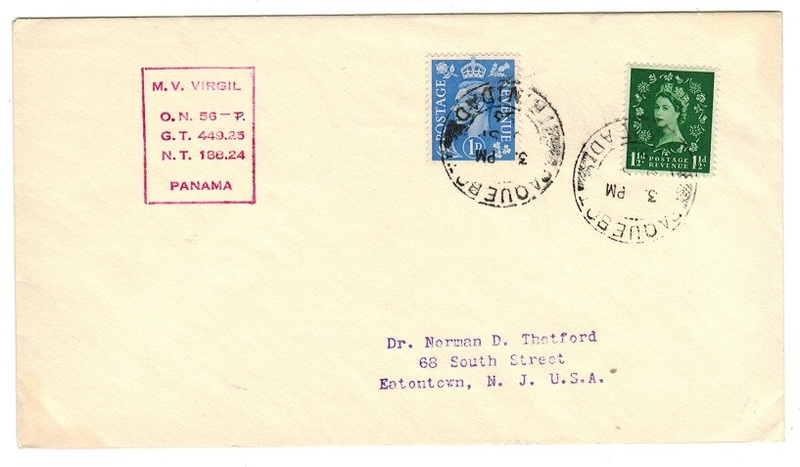 TRINIDAD AND TOBAGO - 1945 6c cover to USA used at CHAGUANAS. 1945 (MAR.1.) 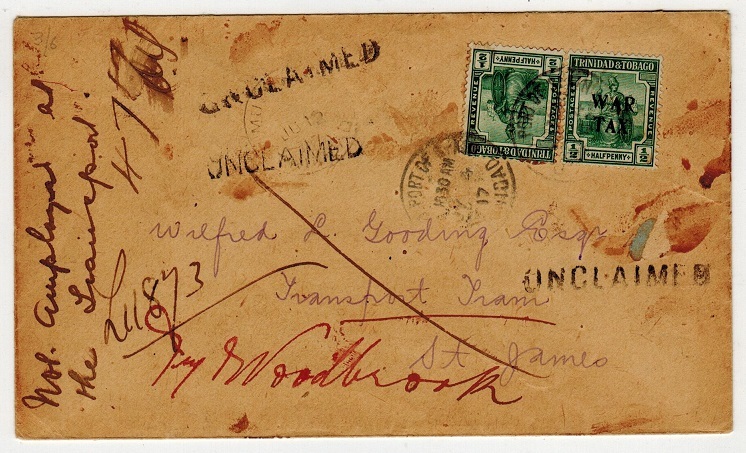 cover addressed to USA bearing 6c adhesive tied CHAGUANAS/TRINIDAD. 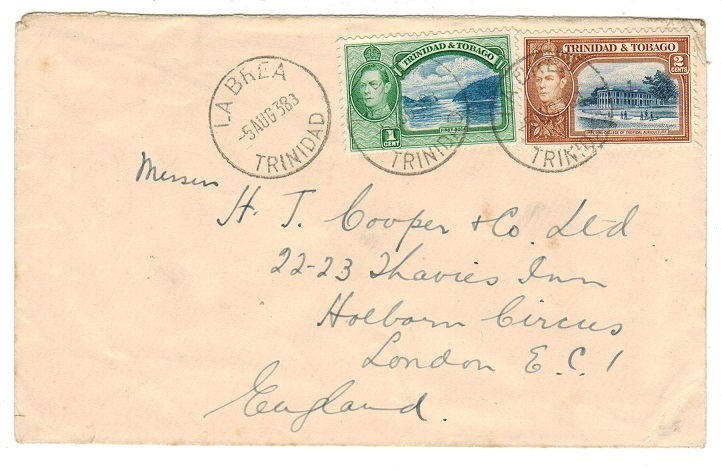 TRINIDAD AND TOBAGO - 1929 first flight cover to British Guiana. 1929 (SEP.25.) 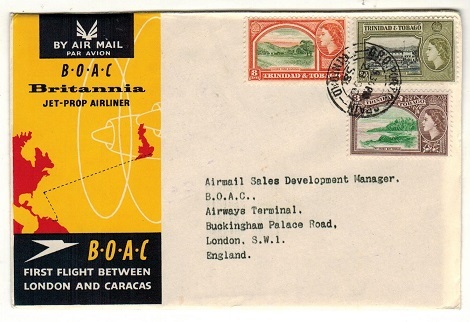 first flight cover addressed to British Guiana bearing 6d and 1/- adhesives tied by PORT OF SPAIN. Carried by Nybra with 423 covers flown. FOREIGN SECTION/B.GUIANA arrival b/s. 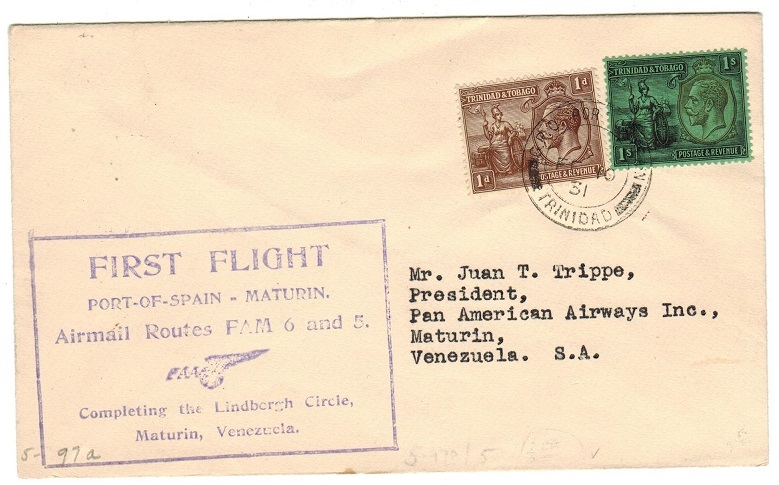 TRINIDAD AND TOBAGO - 1931 first flight cover to Venezuela. 1931 (FE.10.) 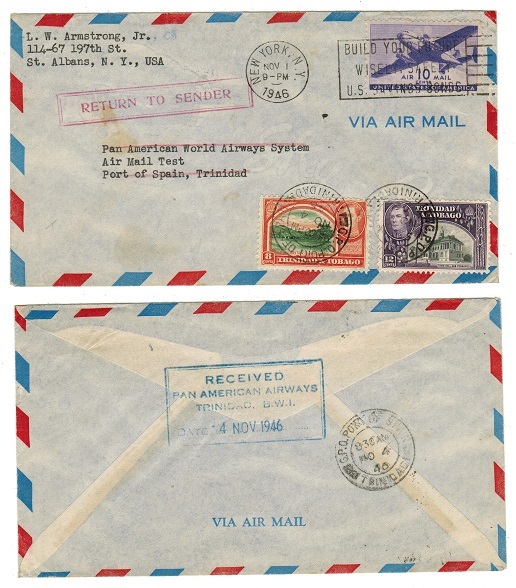 first flight cover to Venezuela bearing 1d and 1/- adhesives tied PORT OF SPAIN and with violet boxed FIRST FLIGHT/PORT OF SPAIN - MATURIN/AIRMAIL ROUTES FAM 6 AND 5 cachet at left. Only 301 covers were flown. TRINIDAD AND TOBAGO - 1884 1d PSC on 'cream' used at PORT OF SPAIN. H&G 3. 1884 1d carmine on cream postal stationery postcard addressed to Germany cancelled by PORT OF SPAIN/TRINIDAD cds dated AP.3.97. H&G 3. 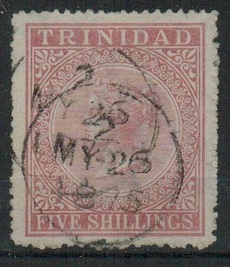 TRINIDAD AND TOBAGO - 1884 1d PSC on 'buff' used at PORT OF SPAIN. H&G 3. 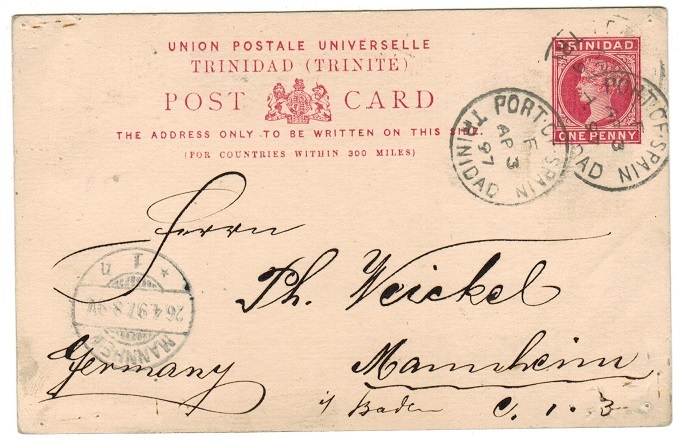 1884 1d carmine on buff postal stationery postcard addressed to Germany cancelled by PORT OF SPAIN/TRINIDAD cds dated AP.3.97. H&G 3. TRINIDAD AND TOBAGO - 1902 1/2d green PSC unused SPECIMEN. H&G 9. 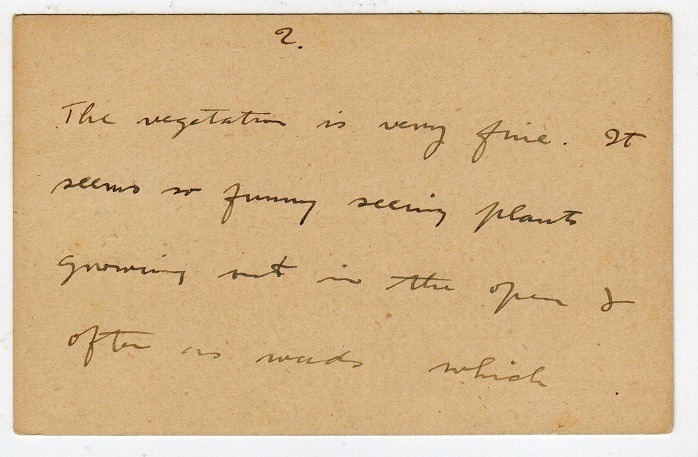 1902 1/2d green on cream postal stationery postcard in unused condition struck SPECIMEN diagonally in black. H&G 9. TRINIDAD AND TOBAGO - 1970 (circa) 70c blue on white RPSE (size G). 1970 (circa) 70c blue on white registered postal stationery envelope (size G) in fine unused condition. 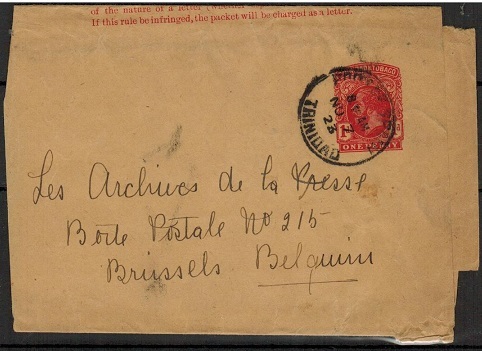 TRINIDAD AND TOBAGO - 1915 1/2d postal stationery wrapper uprated to Belgium. H&G 1. 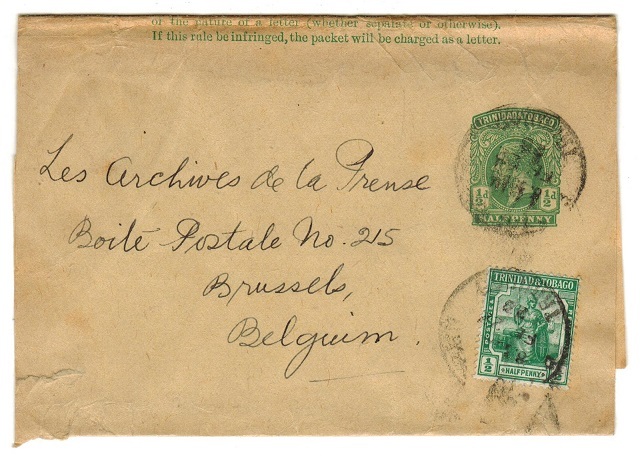 1915 1/2d green on buff postal stationery wrapper addressed to Belgium with additional 1/2d green added and tied by rather smudged FE.22.23 cds. H&G 1. 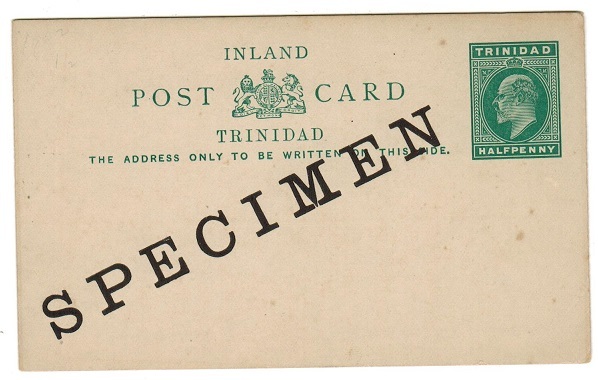 TRINIDAD AND TOBAGO - 1931 postcard to UK with 1d tied PARCEL POST/TRINIDAD. 1931 use of picture postcard addressed to UK depicting 'Digging Pitch-Trinidad' bearing 1d adhesive cancelled by central PARCEL POST/TRINIDAD cds. Unusual. TRINIDAD AND TOBAGO - 1941 PASSED BY/12/POSTAL CENSOR cover to USA. 1941 (AUG.29.) 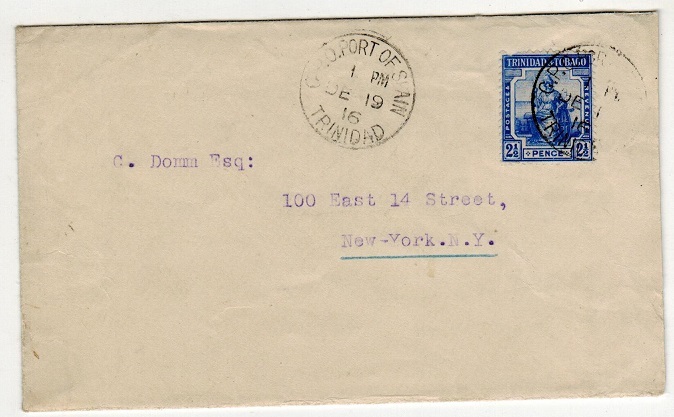 cover addressed to USA bearing 6c adhesive tied PORT OF SPAIN (opened on three sides and with faults) with manila censor strip at left tied on the front by violet crowned circular PASSED BY /12/POSTAL CENSOR h/s. TRINIDAD AND TOBAGO - 1952 registered cover to UK with FOREIGN CARRIER h/s. 1952 (NOV.19) registered cover to UK bearing 'KGVI' 4c, 6c & 24c pair tied by REGISTERED/ TRINIDAD cds's & with scarce violet FOREIGN CARRIER instructional h/s's on front. TRINIDAD AND TOBAGO - 1953 GB adhesive use on cover to USA from PAQUEBOT/TRINIDAD. 1953 (SP.9.) cover addressed to USA bearing GB 'KGVI 1d and 'QEII' 1 1/2d adhesives tied by PAQUEBOT/ TRINIDAD cds with red boxed M.V.VIRGIL/PANAMA maritime handstamp at left. TRINIDAD AND TOBAGO - 1955 8c RPSE with CLEARED FROM/LETTER BOX GPO h/s. 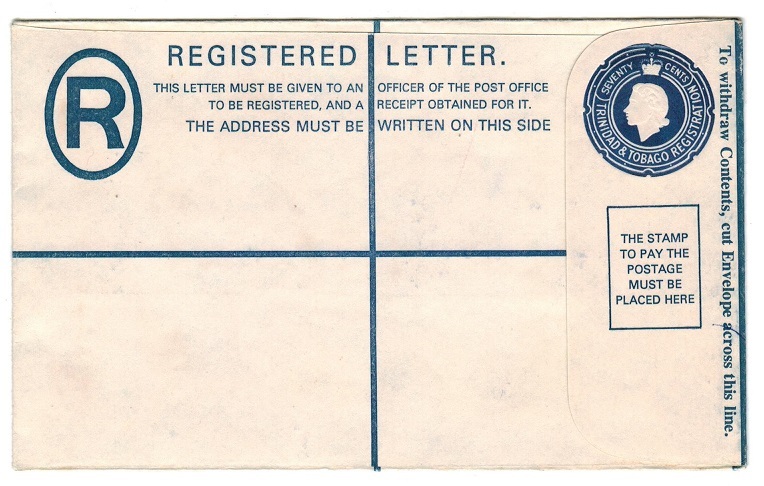 1955 8c Blue on cream registered postal stationery envelope (size G) addressed to UK & bearing additional 12c+24c adhesives tied REGISTRATION/TRINIDAD & with violet two lined CLEARED FROM/LETTER BOX G.P.O. h/s. TRINIDAD AND TOBAGO - 1955 GB 6d air letter use from PAQUEBOT/TRINIDAD. 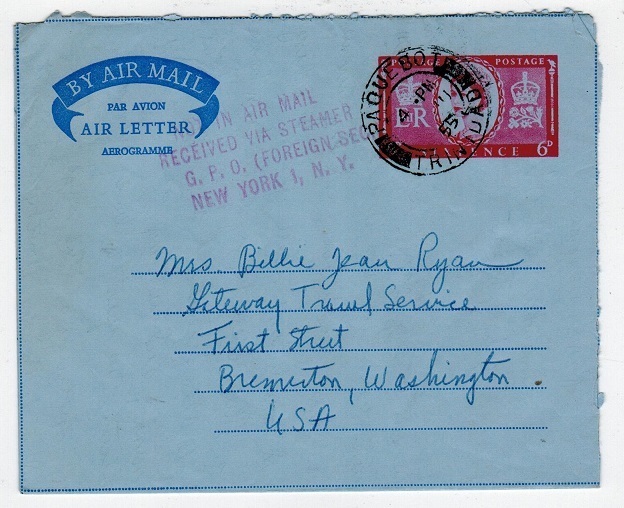 1955 use of 6d red on blue 'GB' air letter addressed to USA (genuine use) cancelled by PAQUEBOT/TRINIDAD cds with violet four lined NOT IN AIR MAIL/RECEIEVED VIA STEAMER/GPO FOREIGN SECTION/NEW YORK 1, NY handstamp at left. 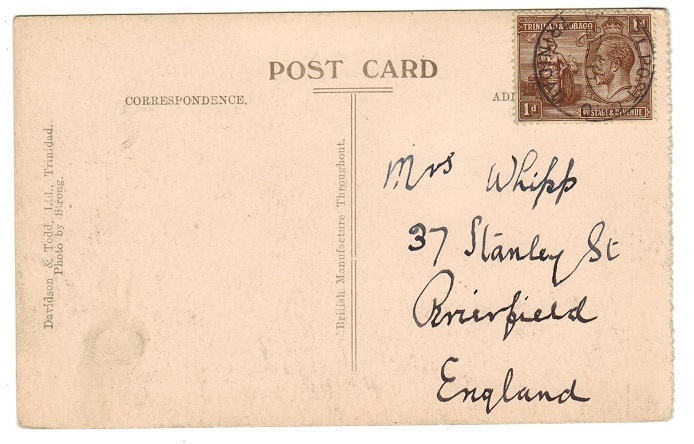 TRINIDAD AND TOBAGO - 1913 OHMS cover to Austria with 1d OFFICIAL use. 1913 (NO.21.) 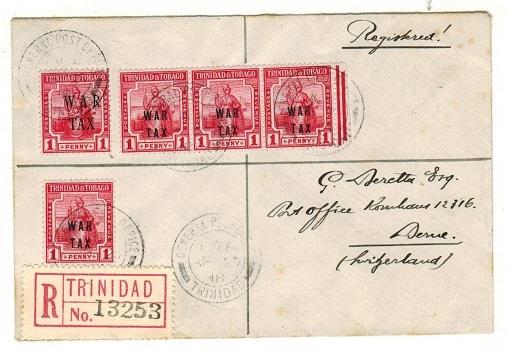 use of long O.H.M.S./General Post Office/Trinidad envelope registered to Austria (scarce) bearing 6 examples of the 1d red overprinted OFFICIAL (SG 09). The six stamps had previously been adhered to paper and have been re-stuck on the envelope but clearly tied by REGISTRATION/TRINIDAD cds's. Three stamps having 'pillars' in bottom margin. Not easy stamps on cover. TRINIDAD AND TOBAGO - 1909 OHMS cover to Belgium with GOVERNEMNT OFFICIAL/PAID h/s in violet. 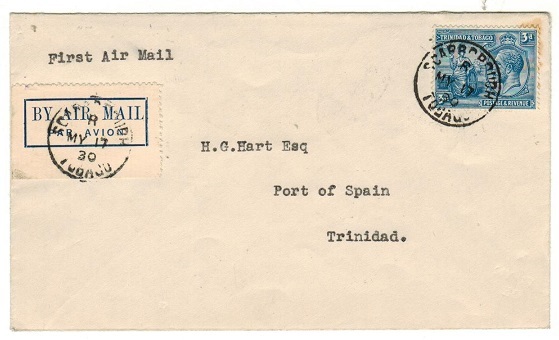 1909 (AU.9) use of long O.H.M.S./DEPARTMENT OF AGRICULTURE envelope sent stampless to Belgium & cancelled by d/r G.P.O.PORT OF SPAIN/TRINIDAD cds with rare violet s/r GOVERNMENT OFFICIAL/PAID/TRINIDAD strike at right. 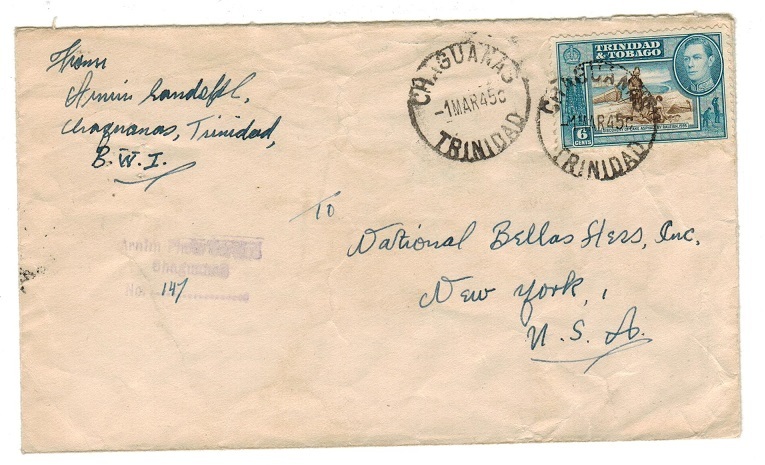 TRINIDAD AND TOBAGO - 1944 TRINIDAD PAID h/s on OHMS cover to Barbados. 1944 (NO.19.) 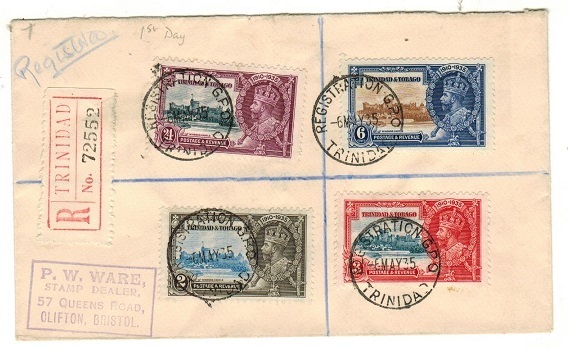 use of stampless OHMS envelope addressed to Barbados (reduced at left and opened on three sides) but struck by violet boxed TRINIDAD/PAID/GOVERNMENT OFFICIAL handstamp in violet (very scarce) with GPO PORT OF SPAIN/TRINIDAD cds below. IC/TRI censor on reverse side. 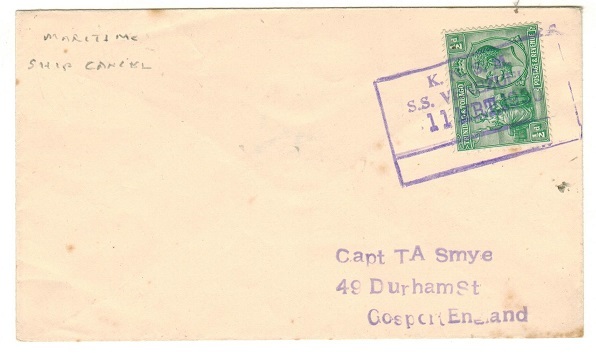 TRINIDAD AND TOBAGO - 1915 1/2d green postal stationery wrapper from PORT OF SPAIN. H&G 1. 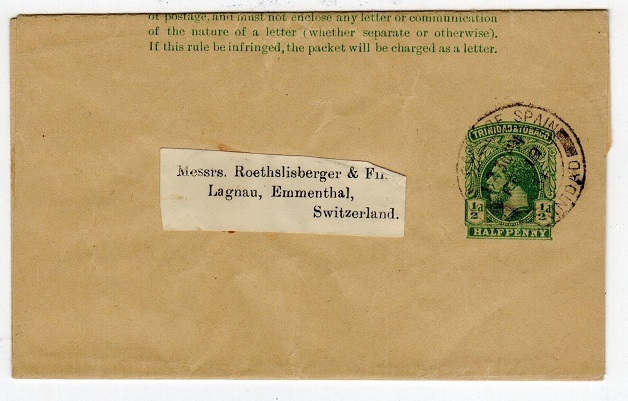 1915 1/2d green on buff postal stationery wrapper addressed to Switzerland & cancelled by PORT OF SPAIN/TRINIDAD cds dated FE.19.31. H&G 1. 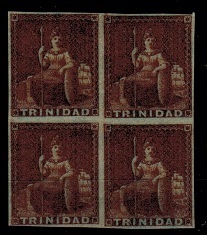 TRINIDAD AND TOBAGO - 1922 1d brown fine used with INVERTED WATERMARK. SG 219w. 1922-28 1d brown in fine used condition showing the variety WATERMARK INVERTED. SG 219w. TRINIDAD AND TOBAGO - 1922 1d brown mint with INVERTED WATERMARK. SG 219w. 1922-28 1d Brown. Very fine mint & with variety WATERMARK INVERTED. SG 219w. 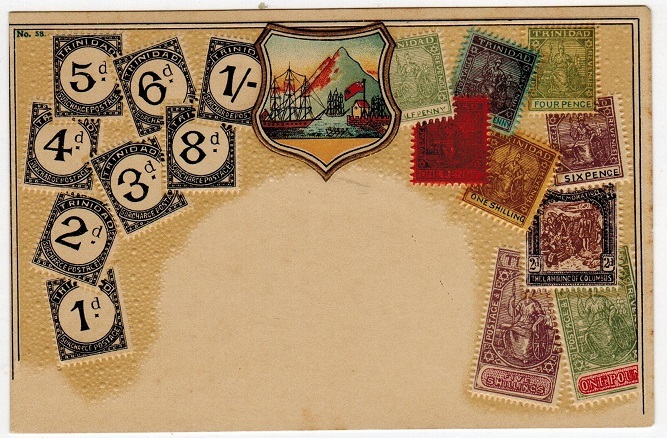 TRINIDAD AND TOBAGO - 1902 (circa) unused postcard depicting stamps. 1902 (circa) coloured picture postcard depicting various postage stamps & postage dues. Numbered 58 & printed in Germany. Fine unused. 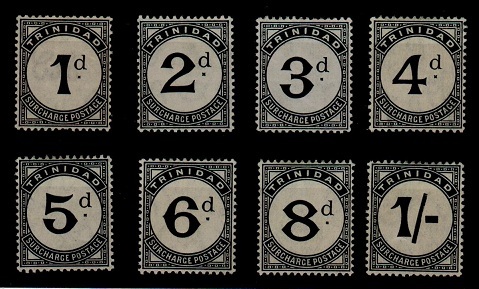 TRINIDAD AND TOBAGO - 1905 'Postage Due' set of eight fine mint. SG D10-17. 1905-6 'Postage Due' series of 8 in very fine mint condition. SG D10-17. 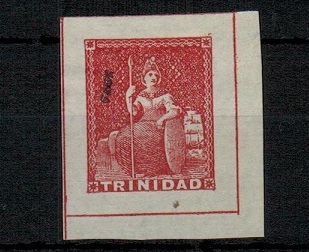 TRINIDAD AND TOBAGO - 1884 local cover with '1d' manuscript on 6d adhesive used at TRINIDAD. 1884 (MR.17.) cover addressed locally bearing manuscript 1d on 6d bright yellow green adhesive surcharge (SG 104a) tied by TRINIDAD cds with sideways 'C' code slug. 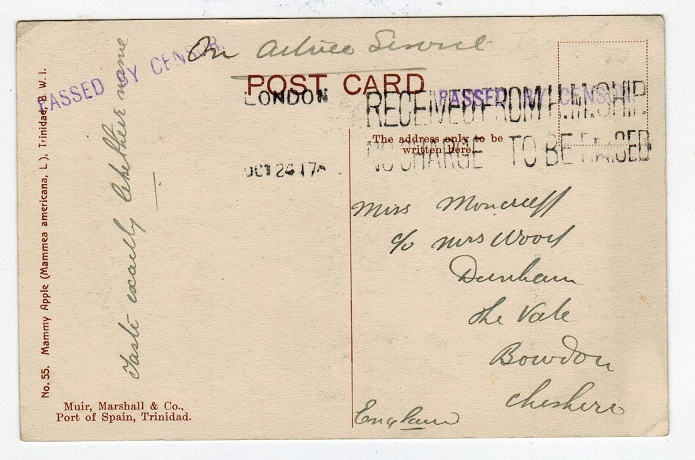 TRINIDAD AND TOBAGO - 1911 1d 'GB' PSRC uprated and returned from PORT OF SPAIN. 1911-15 1d Red 'Downey Head' postal stationery postcard of GB addressed to UK & bearing Trinidad 1/2d (SG 218) tied by PORT OF SPAIN/TRINIDAD cds dated FE.7.28. 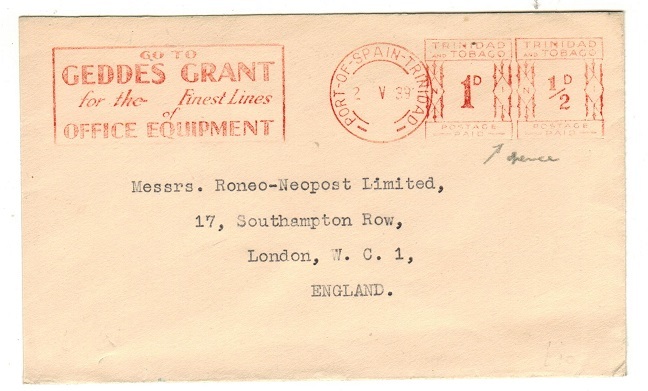 A scarce use of this GB stationery in Trinidad making up the 1 1/2d rate. 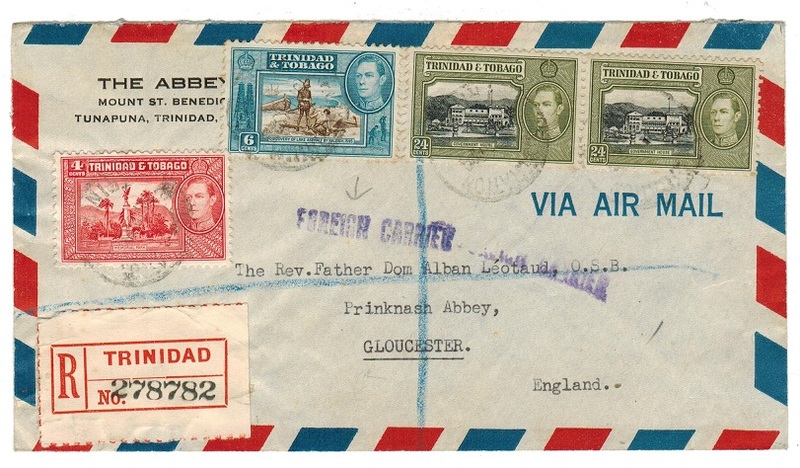 TRINIDAD AND TOBAGO - 1929 First flight cover to USA. 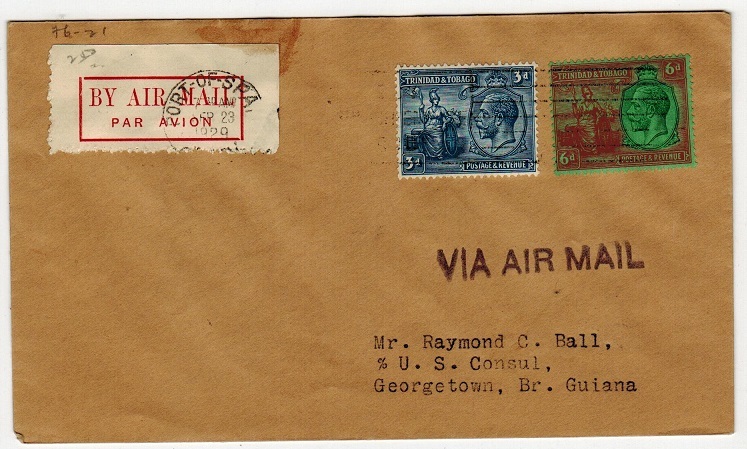 1929 (SEP.25) First flight cover to USA bearing 6d & 1/- adhesives (SG 226+227) tied by PORT OF SPAIN slogan strike carried on the first Port of Spain to Miami flight by PAA. 3227 covers flown. 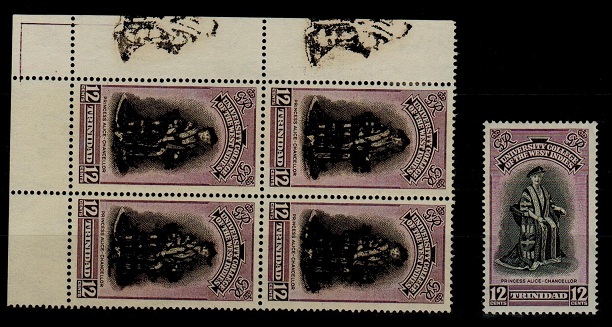 TRINIDAD AND TOBAGO - 1851 (1d) purple-brown mint block of four. SG 2. 1851 (1d) Purple-brown 'no value' expressed adhesive in a very fine mint block of four printed on imperforated blued paper. SG2. 1876 1d scarlet (perf 14) adhesive in a fine mint block of four with REVERSED WATERMARK. An attractive multiple. SG75x. 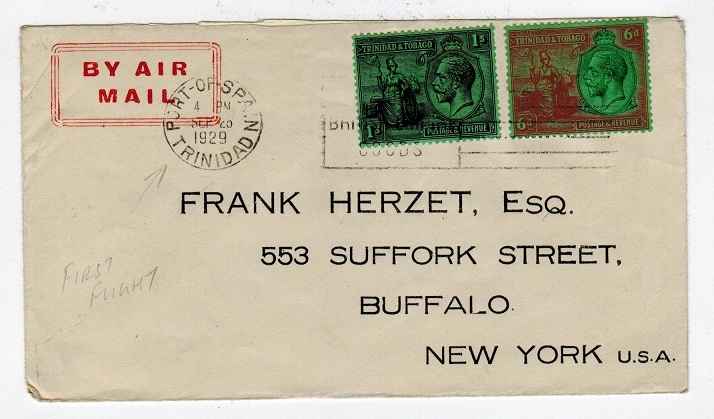 TRINIDAD AND TOBAGO - 1942 cover to USA with OPENED BY EXAMINER/E2 h/s. 1942 (JY.27.) 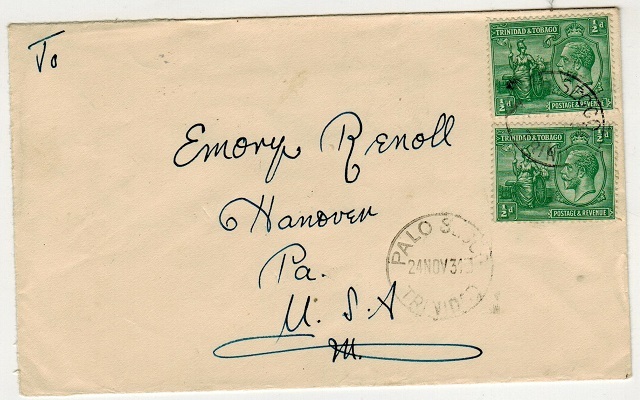 cover addressed to USA (a little toned and with small part of reverse flap excised due to senders name) bearing 6c and 24c adhesives tied GPO PORT OF SPAIN and with manilla censor strip at left edge tied on the front by violet OPENED BY EXAMINER E/2 censor h/s. (Miller type TR CH7). Only used in a 6 month period. 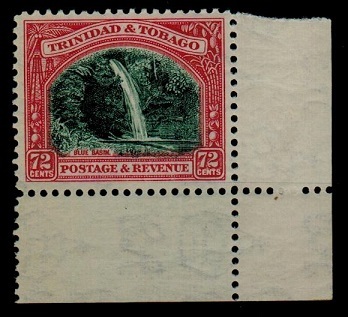 TRINIDAD AND TOBAGO - 1951 12c 'College' adhesive DOUBLE VIGNETTE variety. 1951 12c 'Inauguration Of Univesity College' adhesive in a corner marginal block of four without gum (SG 266) showing the centre design reversed twice in left hand margin and making the design on all 4 stamps appear doubled. Caused by the margin being turned over before the centre vignette was dried making this remarkable 'Reversed Ghost Vignette'. Probably ex printers waste. Complete with issued stamp for comparison. A very unusual and scarce 'KGVI' item. TRINIDAD AND TOBAGO - 1936 2c COIL JOIN pair mint. SG 231a. 1936 2c ultramarine & yellow-brown (perf 13 x 12 1/2) COIL JOIN pair. Very fine mint. SG231a. TRINIDAD AND TOBAGO - 1936 1c COIL JOIN pair mint. SG 230a. 1936 1c Blue & green (perf 13 x 12 1/2) COIL JOIN pair in very fine mint condition. SG230a. 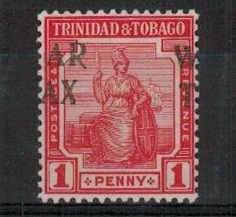 TRINIDAD AND TOBAGO - 1921 series on 9 in fine mint condition. SG 206-15. 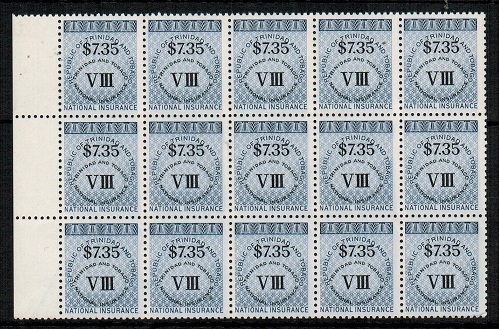 1921-22 series on 9 values in very fine mint condition. SG 206-15. 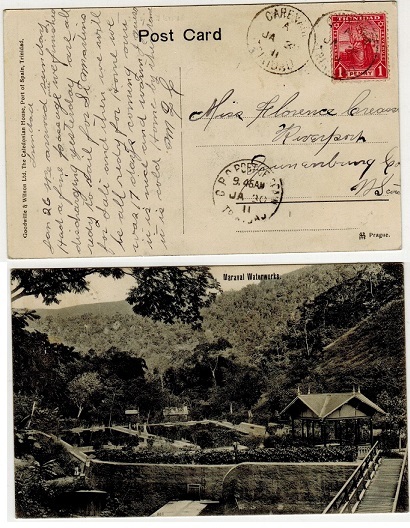 TRINIDAD AND TOBAGO - 1917 stampless OAS postcard with PASSED BY CENSOR h/s. 1917 use of stampless picture postcard addressed to UK (Muir, Marshall & Co, Port Of Spain, Trinidad) depicting 'Mammy Apple' (card 55), marked 'On Active Service' and struck by rare violet straight lined PASSED BY CENSOR handstamp. Taken by ship with two lined RECEIVED FROM H.M.SHIP/ NO CHARGE TO BE RAISED marking applied and with LONDON arrival dated OCT.24. 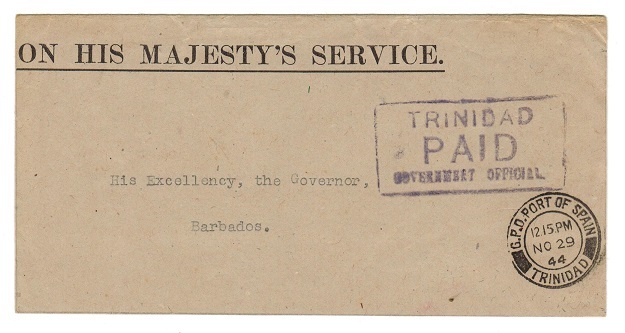 First World War censor covers are very scarce from Trinidad. 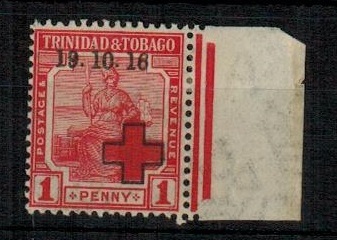 TRINIDAD AND TOBAGO - 1914 RED CROSS cover used locally. Officially sanctioned for one day only. 1914 (SP.18.) 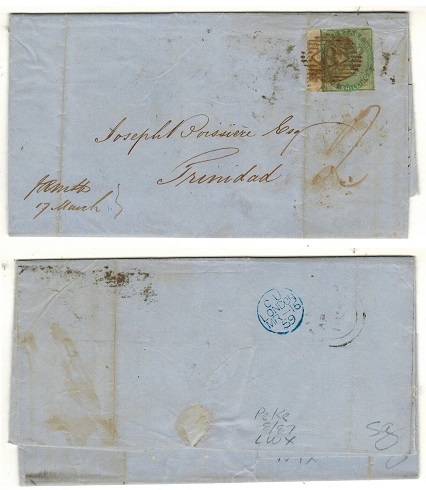 cover addressed locally (crease at left and a little grubby) bearing the (1/2d) red 'Red Cross' label (SG 157) cancelled by PORT OF SPAIN/TRINIDAD cds with similar strike alongside. This being the only day this label was officially sanctioned for postage use on internal mails. 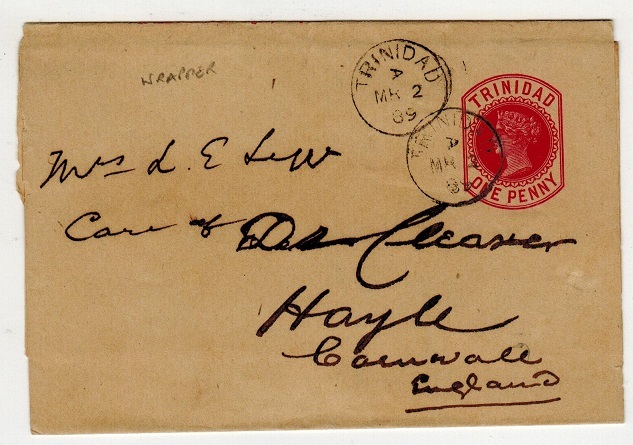 TRINIDAD AND TOBAGO - 1901 TRINIDAD OFFICIAL PAID cover. 1901 (JY.2) stampless wrapper marked in manuscript `O.H.M.S.' & addressed to UK. H/s'd by violet BOTANICAL DEPARTMENT official h/s at left & cancelled by PORT OF SPAIN/ TRINIDAD. The reverse struck by TRINIDAD OFFICIAL/PAID (36mm) cds similarly dated although torn through from opening. TRINIDAD AND TOBAGO - 1881 4d grey on cover to UK. 1881 (AP.7.) 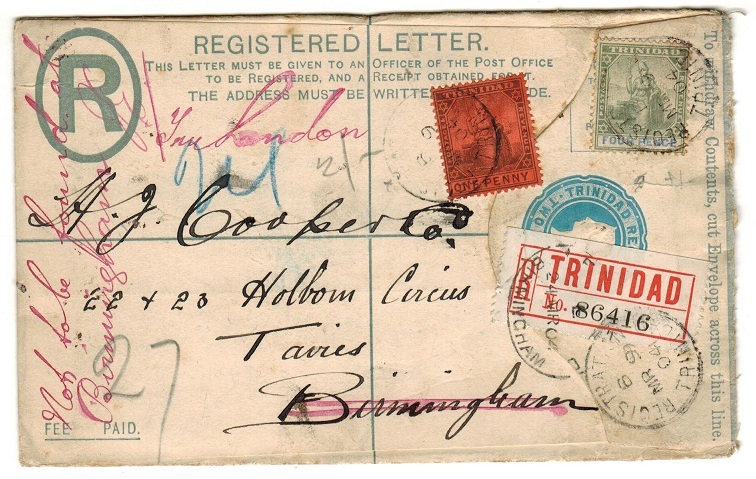 cover addressed to UK marked 'Per Steamer/Via Southampton' and bearing 4d grey Britannia adhesive tied by TRINIDAD cds with additional strike at left. TRINIDAD AND TOBAGO - 1947 UPU folder.